Kailua-Kona, (often referred to as just Kona) is centrally located on the west coast of Hawaii’s Big Island. 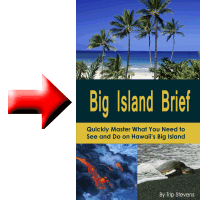 It has a population of around 34,000 and should be considered a destination on your Hawaiian get-away. In ancient times, Kona was considered a desirable place to live due to its pleasant weather conditions and its location on the beach. It was the home of King Kameamea I–the great king who united the Hawaiian islands. The main thoroughfare through Kona, Ali’i drive is the location for many important historical landmarks: . In Hawaiian, the term Ali’i means of noble rank which is an appropriate name for a road where so much Hawaiian royalty lived. 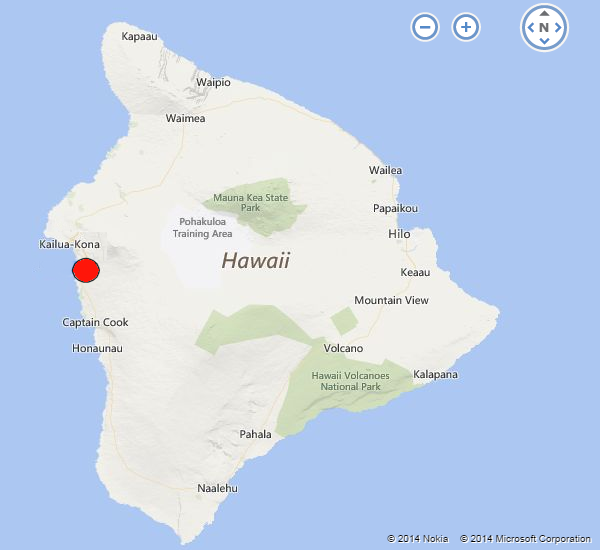 The most interesting part of Ali’i drive begins at Kailua Bay and extends South for several miles. Kailua bay is a popular spot for a number of water activities activities including some world famous events. The world’s longest canoe races, Queen Lili’uokalani Long Distance Outrigger Canoe Races, are hosted in Kailua bay. Since 1959, the Hawaiian International Billfish Tournament has been held there. 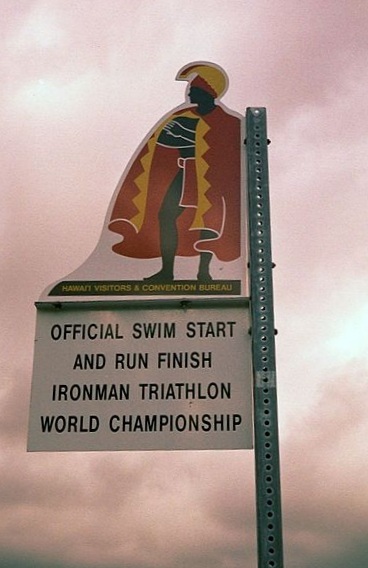 Every October, world class athletes gather at the bay to compete in the Ironman Triathlon World Championship. 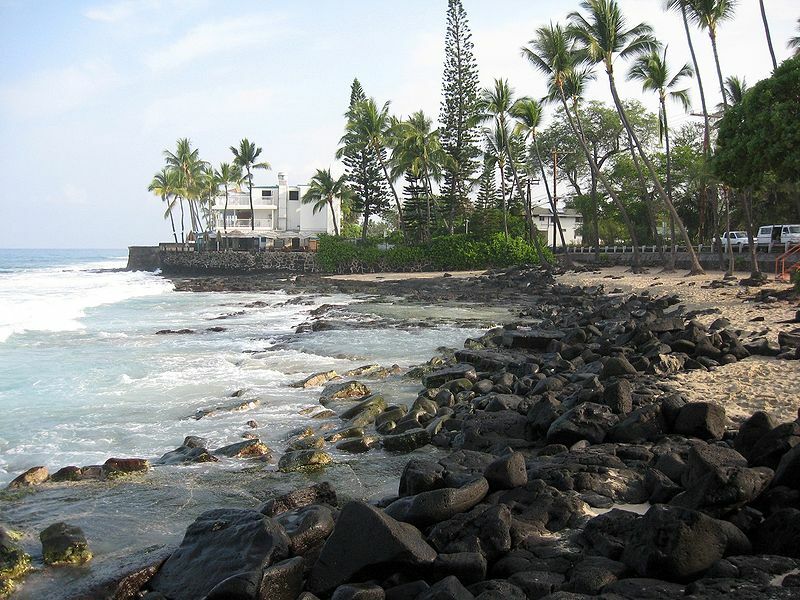 A popular spot at Kailua bay is the Kailua-Kona seawall that runs between the bay and Ali’i drive. Walking on popular path, you can see the bay, people watch and catch killer sunsets. Heading south along Ali’i drive, you will find an assortment of churches, places to shop and historic Hawaiian monuments. 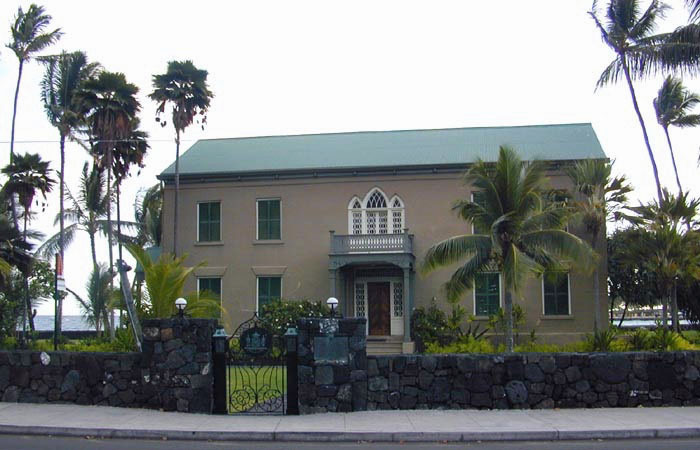 There on Kailua Bay is the only existing royal palace in Kailua-Kona, Hulihe’e Palace. It is only one of three in the United States. The Palace was built in 1838 with lava rock, coral and koa and ohi’a wood. Inside is a museum run by the Daughters of Hawaii. If shopping is your thing, there are plenty of places in Kona to pick up your sea-themed souvenirs to take back home. Some are spotted here and there along Ali’i drive. Others are more concentrated. The Kona Inn Shopping Village (5744 Ali’i Drive) is located on the waterfront. It has 65 stores including gift shops, art galleries and some wonderful restaurants. Drive a couple of miles further south and you have another concentration of shops at the Ali’i Gardens Marketplace (6129 Ali’i Drive). They claim to have 50 shops but the actual number tends to fluctuate with the economy. You can buy Kona coffee, fresh flowers, clothing, and fresh produce. For many, this place serves as a farmer’s market. Besides the coffee and produce you can buy, you can purchase a number of handmade products. 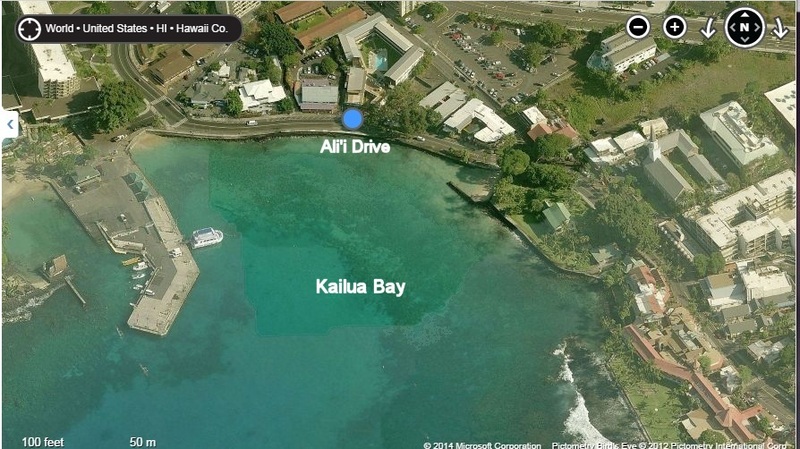 There are a number of opportunities for you to take a dip during your trip down Ali’i drive. If you keep your eye open, you might even see a sea turtle. The water at Wai’aha beach is not to calm for swimming but is a popular spot for boogie boarding. In fact, modern boogie boarding was born at this beach, also known as Honl’s beach. In 1971, Tom Morey, a surfboard builder, built a bodyboard out of polyethylene and hit the waves. Prior to that time small boards were used mostly by children and called paipo boards. After Morey’s new invention, boogie boarding took off with the older crowd. 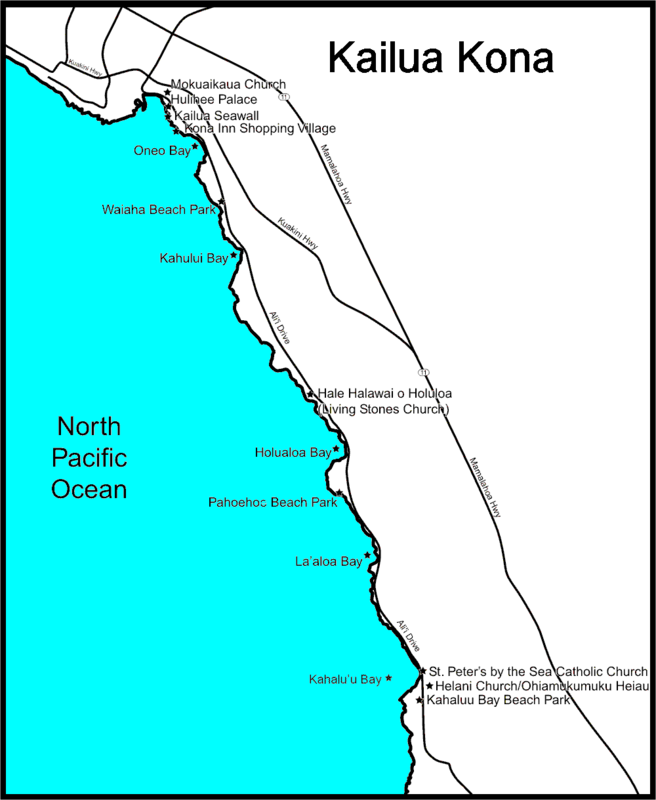 Another popular ocean spot is Kahalu’u beach. There you can snorkel and spot plenty of sea turtles. 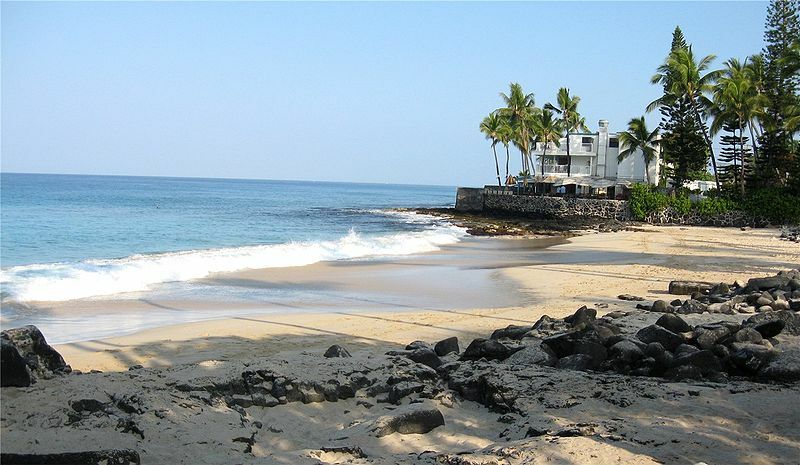 One of the most interesting beaches in Kona is La’aloa Bay Beach also known as Disappearing Sands or Magic Sands beach. During heavy surf, typically during the winter months, the waves can wash all of the sand away in less than 24 hours. After the heavy surf has subsided, the natural wave action and ocean currents will slowly redeposit the sand back on the beach. Below is a picture of the beach before and after the sand has been removed. 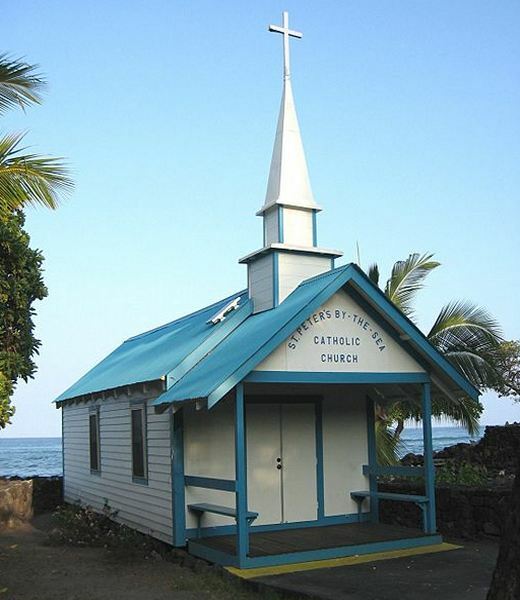 At the South end of the popular stretch of Ali’i bay is St. Peter’s by the sea Catholic church. It was built in 1880 and manually relocated in 1912. While it has survived two tsunamis, the results is that the church has been pushed off its foundation. Affectionately known as “the little blue church”, it is worth a visit. While in Kona, some culinary places to visit would be Scandanavian Shave Ice (5699 Alii Drive) for a vibrant shave ice treat you will not forget, Da Poke Shack (6246 Alii Drive) for a truly Hawaian experience, and Huggo’s on the rocks (5828 Kahakai Rd) for a killer sunset.